The enactment of major tax cuts of American business and the Trump administration’s aggressive campaign to reduce regulations are already impacting the global economy for the better. High tax states, like Maryland, are now considering ways to reduce their tax burdens, and foreign nations are coming to grips with the fact that they may need to reduce taxes to remain competitive with the upstart United States. One country, India, at least rhetorically has been ahead of the curve. For several years, the government under Prime Minister Modi promised American businesses it would reduce taxes, limit regulations, and liberalize their market so more companies could sell to their 1.3 billion plus citizens. Unfortunately, the dream of an entrepreneurial India is turning into another big government nightmare. India has never fully shaken off its socialist past. Its first prime minister, Jawaharlal Nehru, was a Fabian socialist, which fueled his distrust of markets and love of government planning. He and his daughter, Indira Gandhi, ruled India in its formative decades after it gained independence in 1947, establishing an overbearing bureaucratic state, the remnants of which continue to hold India back. Economic reforms didn’t begin until 1991, but after a period of rapid growth started to flounder following the election of a left-of-center government in 2004. 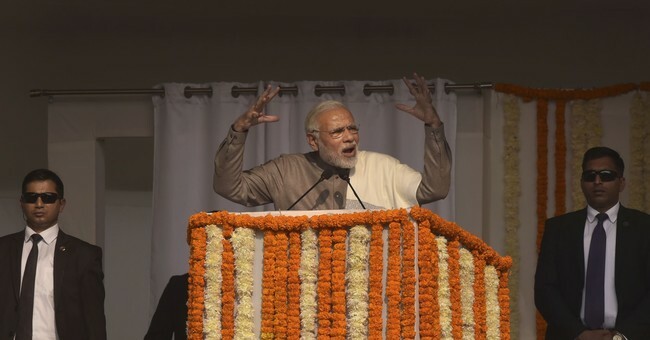 The election of Narendra Modi as prime minister in 2014 was thought to represent a return to the path of economic reform and liberalization, but his record to date has been mixed. Modi’s signature economic program is the Make in India initiative, which seeks “to transform India into a global design and manufacturing hub.” The initiative sells India as an attractive business environment, and it boasts of opening key sectors—such as railways, defense, insurance, and medical devices—to dramatically higher levels of Foreign Direct Investment. Unfortunately, on many of these fronts India has fallen short of its lofty ambitions. For instance, price controls have forced U.S. suppliers of some medical devices to sell at a loss, and the all-encompassing regulatory authority has repeatedly denied permission for manufacturers to withdraw the targeted products from the market. More price controls are said to be in the works and awaiting Modi’s go ahead. Other U.S. multinationals are running into a different sort of problem. GE won a $2.6 billion contract in 2015 to supply diesel-electric engines for Indian railways, but the Ministry of Railways wants to move to 100 percent electric engines and is considering altering the contract. It should go without saying that Darth Vader-style declarations that, “I am alternating the deal, pray I don’t alter it any further,” are not a good way to encourage foreign investment. India is also refusing to comply with a WTO ruling against its ban on imported poultry from the U.S. that has kept our exporters excluded from the market. These and numerous other examples provide a pattern of behavior suggesting that India is not sufficiently serious about economic liberalization. Under this backdrop, it may be time to rethink India’s preferential treatment under the Generalized System of Preferences (GSP) trade program, which provides duty-free imports on certain goods from eligible developing nations. To plan their supply chains, businesses need to know if GSP will be reauthorized. If Congress intends to keep it, then it should not wait long after GSP expires on December 31st before reauthorizing it, a problem which has happened in the past. To reduce business uncertainty, it should also consider a longer authorization term if it’s going to keep re-upping the program every few years anyway. However, the India problem might add a wrinkle to Congressional deliberations. Does GSP even help developing nations as advertised or does it stunt their growth? The Heritage Foundation’s Index of Economic Freedom considers India “mostly unfree,” ranking it a bottom-dwelling 143rd. The Fraser Institute’s Economic Freedom ranking places India 95th, but an abysmal 142nd on the freedom to trade internationally category. GSP favoritism, in other words, appears to have failed to encourage India to embrace economic liberty and open its markets to trade. When it was established, many trade economists argued that the GSP program might undermine the incentive for developing nations to undertake pro-growth reforms. At least in the case of India, that appears to be the case. So, if Congress does move to reauthorize the GSP program, the administration should seriously consider whether India’s continued inclusion is in either nation’s best interests. India has the world’s second highest population, but only its seventh largest economy by nominal GDP. And although economic ties between India and the U.S. have improved, it is currently only the United States’ ninth largest trading partner. To improve its economic position India needs to further integrate with the global economy, follow through on its market rhetoric, and honor its agreements, and the U.S. should reevaluate whether current trade policy is helping.